Wushu will bid again for inclusion in the 2020 as well as in the 2024 Olympics according to the International Wushu Federation (IWUF). “We have to undertake another bidding process,” IWUF executive vice president Anthony Goh said. Wushu, commonly referred to as kung-fu, the collective term for the martial art practices which originated and developed in China, was initially already among the eight sports competing for inclusion in the 2020 Olympics, the others being baseball/softball, bowling, karate, roller sports, sport climbing, squash, and surfing. However, it missed out on the International Olympic Committee’s (IOC) shortlist of three, with wrestling edging out squash and baseball/softball in September for a place at the 2020 as well as at the 2024 Olympics. Wushu could still feature at the 2020 Games in Tokyo, after the IOC overhauled a number of rules in a vote last December that would allow sports an easier avenue into future Olympics. Game organizers can now officially request the inclusion of one or more sports, with the IOC deciding which makes the cut. The decision on which sports will make the final cut would come before the Rio de Janeiro Games next year according to IOC Vice President John Coates. Chinese kung-fu made its Olympic debut during the four-day Wushu Tournament Beijing 2008 at the Olympic Sports Center Gymnasium. It was approved by the IOC, but not as a formal part of the Summer Olympic Games. About 128 athletes from 43 countries and regions participated in the wushu tournament. In fact, through the efforts of the IWUF, wushu has recently been added to the official schedule of the 2017 Islamic Solidarity Games. These multinational, multi-sport games, held every four years, host athletes from 57 Islamic countries spanning the continents of Asia, Africa and Europe. The 2017 Islamic Solidarity Games will take place in Baku, Azerbaijan, from May 12-22, and will feature 22 sports including wushu. 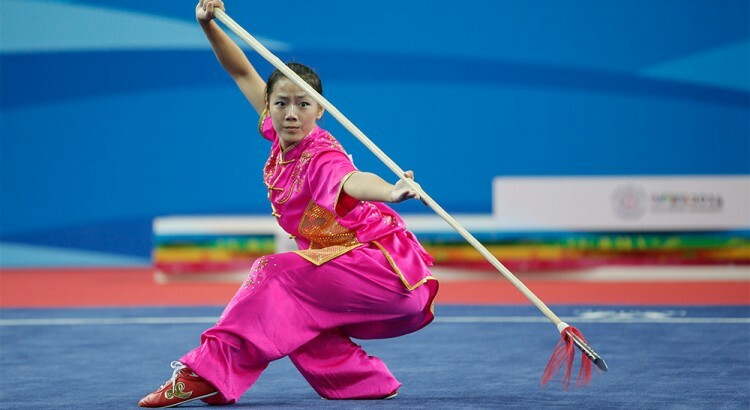 In competitive ‘Taolu’ events, wushu is performed using either compulsory or individual routines. Compulsory routines are those routines that have been already created for the athlete, resulting in each athlete performing basically the same set. Individual routines are routines that an athlete creates with the aid of his/her coach, while following certain rules for difficulty. Some wushu competitions also feature dual and group events. The dual event, which is choreographed beforehand, is an event in which there is some form of sparring with or without weapons or even using bare hands against weapons. The group event requires a group of people to perform together and smooth synchronization of actions are crucial. Usually, the group event also allows instrumental music to accompany the choreography during the performance. The other major discipline of contemporary Chinese wushu is ‘Sanda,’ a modern fighting dicipline influenced by traditional Chinese Boxing, of which takedowns and throws along with striking using arms and legs are allowed. Chinese traditional wrestling like ‘Shuai Jiao and other Chinese grappling techniques such as Chin Na are also allowed in this combat aspect of wushu sport. In wushu tournaments, Sanda or fighting competitions are often held alongside Taolu or form competitions. As with other mixed martial arts tournaments, for safety reasons, some offensive or defensive moves like elbow strikes, chokes, and joint locks, are not allowed during full-contact matches. Competitors can win by knockout or points which are earned by landing strikes to the body or head, throwing an opponent, or when competition is held on a raised platform, by pushing them off the platform. Fighters are only allowed to clinch for a few seconds. If the clinch is not broken by the fighters, and if neither succeeds in throwing his opponent within the time limit, the referee will break the clinch. In the U.S., competitions are held either in boxing rings or on the raised ‘lei tai’ platform. Amateur fighters are typically required to wear protective gear. At the U.S. Wushu Center, students are taught following a programmed series of forms, using different colored kung fu belts to signify what forms students have learned. The belts don’t mean one student is superior to another in technique, only that a student has had instruction in and should be able to perform a specific set of forms. The belt colors used are White, Yellow, Green, Blue, Blue/White, Blue/Yellow, Red, Red/White, Red/Yellow, Brown, Brown/White, Brown/Yellow, and Black.